Recreation in the Yadkin Valley! Picturesque mountains, beautiful landscapes, rolling vineyards, spectacular waterfalls and scenic river views make the Yadkin Valley region an adventure all its own. But there’s much more in store for parents, kids, group travelers, adventurous scouts, hard workers who need a break, or anyone who wants some get-away-from-it-all fun. From community fairs to family fare, from classic car shows to historic reenactments, from little league competitions to senior day events, there’s something for everyone here. There are countless places to window shop, grab a bite, bag a bargain, or sit down to a delectable dinner at an elegant restaurant. Whether it’s T-ball or softball, peewee football or youth basketball, tennis or golf, Little League or Senior League, everyone has a ball at Elkin Municipal Park and Recreation Center. There are scenic trails, playgrounds, picnic shelters and programs for every age group. Special events planned for those who are 55 or older allow participants to set their own pace. They can enjoy a concert in the band shell followed by a leisurely game of Horseshoes, or some serious track and field events with other competitive seniors. For younger kids, a day at summer camp may involve arts and crafts, music and drama, or an educational and adventurous field trip. Kids can hone their skills at the skate park, join the swim team or just splash around in the pool. Whether it’s an afternoon picnic, an evening volleyball game or a nighttime tennis match on a lighted court, Elkin Park serves up fun every time, in every season. Kids and adults look forward to summer camp, Holiday Camp, Easter egg hunts, Halloween festivities and other seasonal events. A highlight of the park is a new state-of-the-art fitness center, which contains equipment that makes each workout a motivating, high-tech adventure. The center includes new Nautilus machines and cardiovascular equipment. The many other available facilities include a racquetball court and gymnasium. Main Street hasn’t lost its charm in Elkin. Renovated landmarks, homespun shoppes, refurbished storefronts, start-up shopkeepers and merchants who’ve been there half a century all add to the unique flavor and ambiance of an old-style downtown. Streetscapes and a restful waterfall encourage visitors to slow down and enjoy a less harried pace. The town hall, police station, library, visitors center, post office, arts council and local newspaper publisher can be found in this conveniently central location. Practical services are right at hand, too, including dentists, dry cleaners, bridal shops, travel agencies, attorneys, insurance agencies, pharmacies and banks. 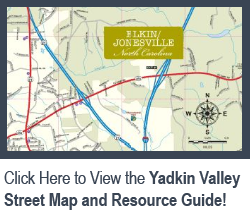 Whether you want to do business, dine or shop, it’s all here: fine cuisine or home-style barbecue, art galleries, thoughtful gifts, musical instruments, attic antiques, country crafts, vintage clocks, collectible ceramics, beautiful jewelry, fine art, fine china, fine furniture and more are always just around the corner in Elkin. Fairs, festivals, food and fun are also part of the ambiance of Elkin. Check out the region’s oldest antique car, largest pumpkin, or smoothest Cabernet. Plan ahead to attend one of many special events to suit your own favorite season and style. Pilot Mountain State Park and Stone Mountain State Park are just a short, scenic drive away. The dramatic peak of Pilot Mountan towers above the surrounding landscape and invites people from all around to come enjoy the view. Visitors are invited to hike, climb or ride horseback through its wooded paths; they may also fish, raft or canoe the tranquil, meandering and historic Yadkin River. Nature trails along the river offer another way to appreciate the scenery. Stone Mountain State Park is also conveniently close. Its centerpiece and namesake is a stunning, domed mountain with a polished, gray-granite surface. The equally spectacular Stone Mountain Falls is another timeless attraction. Those with the perseverance to climb more than 250 steps to its summit will enjoy an amazing panoramic view of the Blue Ridge Mountains and surrounding terrain. Thousands of acres of gorgeous woodlands and parkland are just waiting for climbers, hikers and anglers. Trout fishing in this area is considered to be some of the best around. Both of these national parks are ideal for leisurely family outngs and adventurous sports enthusiasts alike. Each is a perfect place for a picnic, a relaxing walk, a rigorous hike or a health-enhancing jog. Photogenic Blue Ridge Parkwway is another natural resource that weaves its way through the mountainous terrain. From camping to exploring, it’s a perfect get-away-from-it-all haven. Plan ahead to take a long, scenic drive to enjoy its natural beauty. Visit in the warmer months when flowers such as the Carolina Rhododendron and the Indian Paintbrush are in bloom, or come when it’s cool and cross-country ski for a beautiful and tranquil experience. Join the Yadkin Valley Chamber of Commerce Today! For more information about becoming a member of this vital business organization, please contact the Chamber of Commerce office at (336) 526-1111 or submit your information online to begin the Chamber Member application process.